Dietary Values on Vitamin Bottles ~ The Reluctant P.O.W. Diet supplement warning. Every wonder how old the science is on those DV values (Daily Values) that are on your bottle of vitamins and minerals label? Most are from 1968. 43 years ago! Now to put this date in a more visual way, Elvis was still alive during this time and Senator Kennedy was shot that year. Yep, that long ago. The RDA of Vitamins K and selenium are based on the 1989 NAS (National Academy of Sciences) RDAs (Recommended Daily Allowance), and manganese, chromium, molybdenum, and chloride are based on the 1989 ESADDIs (Estimated Safe and Adequate Daily Dietary Intakes) also by NAS. The problem is that under the NLEA (Nutrition Labeling and Education Act, 1990) laws of the USA, partially contained in The Federal Code of Regulations, manufacturers have no choice but to use these values expressed in the Code on dietary supplements in order to be in compliance. Your probably asking yourself if this is true, why hasn't anyone updated the values? The answer is that the nutrient amounts a human needs has been studied and updated several times over the years and the nutrient list has expanded over the years. Some done by different USA agencies each printing and distributing "their" information. In addition, a avalanche of abbreviations are used to convey their meanings to you and me. The FDA (Food and Drug Agency) is charged with defining and enforcing food labeling. Now an average US citizen would think this agency would have the answers, and in some ways they do. They team up with the USDA (U. S. Department of Agricultural) and HHS (U.S. Department of Health and Human Services) to write the Dietary Guidelines For Americans (2010) which may be rewritten every 5 years as needed. The first issue was written in 1980. Dietary Reference Intakes (DRI) are developed for individual nutrients by the Institute of Medicine's Food and Drug Board (IOM) and started being printed in 1997. Although not considered to be a DRI that provides a defined intake level, the IOM also set acceptable macronutrient distribution ranges (AMDRs) for carbohydrate (i.e., sugars (mono-, diand oligosaccharides) and starch), total fat, n-3 and n-6 polyunsaturated fatty acids, and protein. They are updated as scientific information determines there is support for a change in the numbers. What happened to the RDAs? Good old RDA. We all grew up with it. We all knew what it meant and had accepted it. RDA's were a World War II baby, originally developed in 1941 to make sure we all were eating well during the war and that our soldiers got the nutrients they needed to fight another day. The RDA values were created by the NAS and it is their values from 1968 that the old "U.S. RDAs" are based upon. In 1993 the FDA changed the acronym U.S. RDA to RDI (58 FR 2206 at 2207) to avoid confusion with the acronym RDA. Well . . . RDA was phased out by the above referenced term Dietary Reference Intake (DRI) in 1997. The RDA acronym no longer appears on supplement labels. Or at least should not. So what did we get to replace it? DV is the short answer. It is a simplification of the RDA, but doesn't take into account age or gender. While the DVs do not represent dietary goals for individuals, their intended use is to provide an overall population reference value on the food label for the consumer (55 FR 29476 at 29481). Expiration dates indicate how long the contents will be effective. 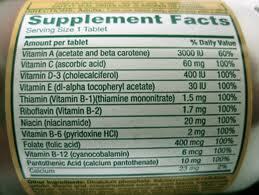 After the expiration date, the vitamins will have aged to a point that they no longer contain the "% Daily Value" indicated on the bottle and have started to degrade. Double asterisks in place of DV listings mean that DVs have not been established for these nutrients. 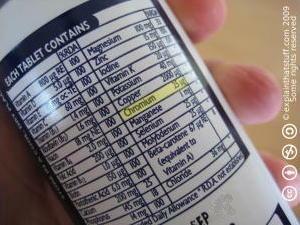 "Other ingredients" are compounds that do not directly contribute to the nutrient DVs in the supplement.